The Russia-led Eurasian Economic Union, sometimes simply called the "Eurasian Union", was officially launched at the beginning of this year. Read on for a brief introduction to this major new regional organization, which you can expect to hear a lot more about in the coming months and years! 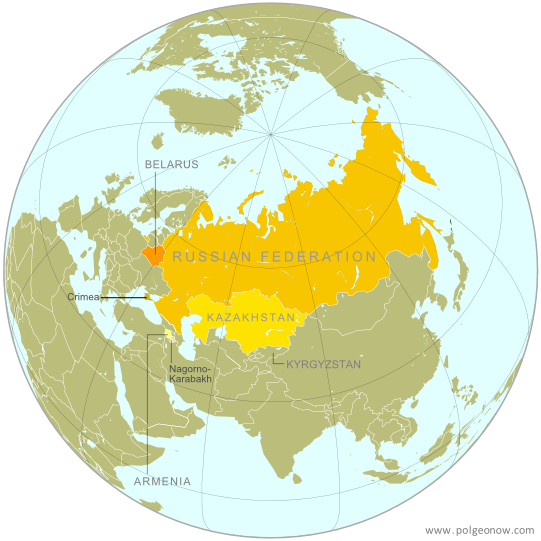 The Eurasian Economic Union (EEU, EAU, or EAEU) was officially launched on the 1st of January, 2015 by member countries Russia, Belarus, Armenia, and Kazakhstan, with Kyrgyzstan awaiting membership next month. The goal of the union is to allow for the free movement of goods, services, capital, and labor among the member countries. The EEU operates through supranational and intergovernmental institutions including the Eurasian Commission, which serves as the executive body, the Court of the EEU, which acts as the judicial body, and the Eurasian Development Bank. All member states are said to retain full sovereignty and have the same veto power, despite the fact that Russia has financed up to 88% of the organization's administration. The EEU is built upon less-extensive cooperation previously established in 2007 through the Customs Union between Russia, Belarus and Kazakhstan, and in 2012 through the Common Economic Space. The union has a population of over 170 million people and a GDP of nearly $2.5 trillion, making it the largest common market in the ex-Soviet region. Energy sources constitute the strongest grounds for EEU cooperation. This is no surprise, given that Russia, Belarus, and Kazakhstan share over 20% of the world’s gas resources and 16% of its oil, in addition to being strong producers of electricity and holding large reserves of coal, steel, and iron ore. According to Russian Prime Minister Dmitry Medvedev, over 100 agreements to develop a common oil and gas market are expected to be signed in the EEU during 2015. Iran, Argentina, Egypt, China and India have reportedly already expressed interest in establishing cooperation and creating a free trade zone with the EEU in the future. Recently, Russia’s ambassador to the European Union (EU) proposed that the EU renounce the Transatlantic Trade and Investment Partnership (TTIP) with the United States to instead enter a partnership and establish a free trade zone with the EEU. Although the EEU is currently intended to be a purely economic cooperation block, the union is considered to be Russia’s most ambitious attempt at integrating the region that once formed part of the Soviet Union. Its creation has not been universally welcomed, with some outside obervers seeing the integration process as a symbol of aggressive Russian policy, particularly following Russia's seizure of Crimea from Ukraine, whose new government chose not to seek EEU membership. Graphic of the EEU flag is in the public domain (source).